The wedding wasn’t until three–and Laurie didn’t expect any of us to be there until one, which left us with a free morning in Colorado. “Do you have any suggestions for what we should see tomorrow morning?” we asked at the rehearsal dinner. Laurie suggested the Black Canyon and gave us basic directions. Okay, we thought. We’ll check it out. See the little local wonders in our free time. As we drove along the designated road, we wondered if we’d missed it. “Was that it?” we wondered. And then there it was. We stopped, aghast at how we’d underestimated the place. We moved eagerly from look-out point to look-out point, running as quickly as we safely could to see as much of the canyon as possible in our limited time. “How can anyone see this and say there is no God?” we wondered aloud. On the drive through the Rockies, I’d asked how the mountain chain was formed–and had looked up the answer on my Kindle (I <3 Free 3G!) Per current geological understanding, the Rockies were formed via plate tectonics in the Laramide orogeny. The Black Canyon of the Gunnison was the result of swiftly moving water gradually cutting down rock to create the beauty we see now. The raw material from which God would form the mountain was made in a single creative act at the beginning of creation–but the beautiful mountain and canyon were not built in a day, or in a single experience. They are the result of years and years of steady influence, shaping them into what I wondered at this weekend. In the same way, God created spiritual life in me in a single act when He saved me. But a beautiful spiritual life is not formed in a day or in a single experience. It is the result of years and years of continued submission to the hand of God, allowing Him to shape me. The little choices of submission are hard, but the end result is worth it. For I trust that someday someone will look at this little canyon and wonder. And I trust that someday, when someone looks at this little canyon in wonder, they will turn their eyes to Christ and worship. It is for that reason I invest in spiritual disciplines, like a mountain submitting to the relentless flow of water. Because a beautiful life brings Him glory. May I ever see beauty and wonder at it, worshiping the One who made it. And may my life become beautiful, that I might incite those who see me to wonder at and worship the One who made me. I recently purchased a Kindle (rather a shock to everyone, myself included) and have been doing a bit of browsing of the free books available in Kindle format. Many of my favorite classics are available for free, for which I am immensely grateful–but I’ve also enjoyed looking at some books that I otherwise might never have picked up. Books like Mrs. Isabella Beeton’s The Book of Household Management. Some of the advice gets somewhat strange, intended as it was for a totally different age. But some of it rings out with ageless truth. It is when my resources seem insufficient that I can test and prove good management. It is no credit to me when I can live well with plenty. In a culture that forever cries out “more, more” and dreams of getting rich, when those around me have nicer clothing and cars and houses, this is a good reminder. Oftentimes, even in material things, I am richer than they. They are enslaved, in debt, in order to obtain their belongings. I have sufficiency and am not indebted. I love this illustration and how it warns against the two extremes that we all are prone to fall into. May I be a sharp blade, put diligently to the task. Five weeks ago, my Sunday school class turned a corner. We finished the Old Testament and began the New Testament. Last week, we reached another bend in the road. With the book of Acts, we entered the era of the church. And my job as a Sunday School teacher got a lot harder. I have a dozen students, give or take. Some have made professions of faith, others have not. Some are likely regenerate, others may not be. Teaching the Old Testament is easy. Almost every line tells of our desperate need for salvation and our absolute inability to effect salvation of ourselves. Every line points forward, from where many of my students likely are (unregenerate) to Christ’s work. Teaching the New Testament is hard. Good questions, necessary questions, but ones I have a hard time teaching to little unbelievers. The epistles can quickly become either a set of doctrines to memorize or a set of rules to follow–unless one has already been gripped by the reality of the gospel. Which is why I must be wary. I cannot follow the popular Sunday School treatment of the New Testament–in which the armor of God becomes something one works hard to put on and the fruit of the Spirit become something one works hard to produce. Instead I must point my students backwards, ever backwards. The author of Hebrews speaks of leaving the elementary doctrines of Christ, not laying again a foundation of repentance from dead works and of faith toward God (Heb 6:1)–but I cannot do this. I am laying a foundation. My students are not yet mature. To teach them mature doctrine would be fatal–for without the foundation of repentance from dead works, I set my students up to become self-righteous dead men. If my students are allowed to think that they are good, that they know much, that they are wise and holy and right, I have failed as a Sunday School teacher. Because good, holy, wise, and knowledgeable students see no need for Christ. Which means that good, holy, wise, and knowledgeable students will die in their sins. “I am indeed a sinner in this life of mine and in my own righteousness, but I have another life, another righteousness above this life, which is in Christ, the Son of God, who knows no sin or death, but is eternal righteousness and eternal life. This is what I strive to teach my students, even as we move from the simpler to the more complex portions of Scripture. I must forever point them backwards to the futility of their works and the absolute sufficiency of Christ for salvation. Any other teaching, at this point, would be presenting a false gospel. I know many people who are terrified of bees and who will freak out if one comes closely. They fear that the bee will sting them. I know only a very few people for whom a bee sting will be anything more than a minor inconvenience. The majority of individuals will experience a little pain that will quickly be dealt with. Contrary to popular belief, bees rarely sting without provocation. I have, in fact, spent hours within a few yards of some of the buzzing insects without being stung. Bees don’t gain nourishment from stinging people, like mosquitoes do from biting people. In fact, stinging a person often deals a death blow to a bee. It goes like this: The bee’s stinger is barbed along the end. When a bee stings, its stinger becomes lodged in the skin of the person being stung. Depending on whose skin is thicker, either the bee will manage to pull its stinger out by breaking the individual’s skin or the bee will withdraw, leaving its stinger and part of its abdomen within the person’s skin. The savvy stingee will then scrape the stinger free and apply something basic to his skin to alleviate the pain and swelling–while the bee will live only a few minutes longer before succumbing to the inevitable results of being torn in half. The bee has managed to create minor irritation for the person he has stung–but the person has effected the bee’s death. I wonder if the bee feels a bit of triumph in that stinging moment. Does he recognize and rejoice in the pain he is causing? Does he realize that he has killed himself? I know that the enemy of our souls buzzes like a bee. Like a bee, he flew about Christ’s head, seeking to provoke him to sin during the time of testing in the wilderness. Later, being provoked by Christ, he sought out an opportunity to sting. Time after time, his tricks were evaded by the wily Christ whose time had not yet come. And finally, the day arrived when the enemy was set to sting. The chief priests and elders were ready. A disciple had agreed to betray his leader. A mob was prepared to demand Jesus’ death. The bee inserted his stinger, injected the poison. With a thrill of relief, he declared that he had fulfilled his objective. The Son of God was dead, crucified, defeated! The bee pulled away from the crucified Lord, ready to return to his hive. The searing sensation in his abdomen told him something wasn’t right. He’d left something behind. He returned to his hive, not for a victory celebration, but to await his death. For in stinging Christ, the bee had been defeated. For those who trust in Christ, the stinger is left in Christ. Death no longer has any sting. Christ has borne the sting and death himself will die. With less than one week before books are due back to the library, I’m in a frenzy trying to get several books finished up. The below is just a sampling of what I’ve been reading. I’m not a George W. groupie by any stretch of the imagination. I certainly disagree with some (even many) of his policies. But I admire him greatly–and am immensely thankful that he was our leader during the years after 9/11. Reading Decision Points has cemented my admiration of the 43rd president. Whatever I think about some of his policies, George W. Bush was a leader. He recognized that he could not sit idly by, waiting for someone else to do what he thought needed to be done. He took personal initiative, took personal responsibility, and took the harsh criticism that came with standing as a leader when many would have preferred a figure-head. Considering that Palestinian-peace-obstructing Yasser Arafat won the Nobel Peace Prize in 1994, I’d say Blair is probably right. Pre-modern animism raised animals to have human (or godlike) attributes. Modern naturalism lowered humans to have merely animal attributes. Yet only Christianity can account for man’s wonderfulness and horridness. A very Biblical sentiment. “The borrower is the slave of the lender” (Proverbs 22:7). Waiting. It’s one of the most difficult tasks of my life. For someone who hates to waste time, who wants to pack every moment full of something, waiting is terrible. “I want to get on with my life,” I say. I’m tired of waiting around for so and so to “talk it over”, for one or the other to “think about it.” I’m tired of waiting to get the okay from the higher ups, of waiting for the lower downs to catch up to where I’m at. I’m tired of waiting until I’m married, or until I have children, or until I own a house. But waiting isn’t wasted time. Dwell in the land [make your home, settle down, be at peace where God puts you]. Delight yourself in the Lord [make the Lord your only joy], and he will give you the desires of your heart. Waiting has a purpose. Whatever its temporal purpose, it has a long-lasting purpose that far surpasses the momentary agony. In it, I learn to trust in Christ. I learn to cling to Him. I learn to make Him my heart’s delight. Even if I die still waiting, my waiting will be worth it. For I will not die lacking. I will have Christ–and Him plus nothing equals everything. I have officially discovered that highlighting something on Facebook using Diigo accomplishes exactly…nothing. So the great quote I had (that I can’t remember who posted) is lost. Love this. So true. God doesn’t accept my sin–He paid for it. He doesn’t just look over my sin–He gave me His righteousness instead. Almost incomprehensible, the Incarnation is. But I am so thankful that the Son forever became fully man, while remaining fully God, that I might no longer be estranged from God. And, somewhat off the topic, this week I taught my 2nd and 3rd graders about God’s justice and mercy, the penal substitution, and explained how Jesus didn’t physically “go to hell”. The kids were tracking. I think we underestimate what they can learn. No idea, but whatever age I get, I’m going to keep pounding home my point, like a broken record: the gospel is on every page of Scripture. So far, Breadcrumbs by Anne Ursu has completely stolen my affections. It’s fantastic. “She stood looking at the line of trees that demarcated the woods as clearly as any doorway. Uncle Martin was right. She knew it at that moments. There were secrets, and there were witches in white, and somewhere there was Jack. She wished he were with her now. Hazel had read enough books to know that a line like this one is the line down which your life breaks in two. And you have to think very carefully about whether you want to cross it, because once you do it’s very hard to get back to the world you left behind. And sometimes you break a barrier that no one knew existed, and then everything you knew before crossing the line is gone. Have you met one of those lines, a line where life breaks in two? Will you step into the uncomfortable to go on a mission trip? Will you break off that relationship you know you shouldn’t be in? Will you venture into an unknown city? Will you give up your most cherished dreams? You stand at the line, indecisive, knowing that what you decide will change your life. Behind lies comfort, life as it’s always been. Predictability. Safety. Concrete reality. In front lie only questions. Will you risk having your life broken in two? I’ve stood at the line many a time. Will I go? Will I venture? Will I enter the unknown? Sometimes you have a friend to rescue–or sometimes you realize that the friend beckoning on the other end wants to rescue you. So you take a deep breath and then step over the line and into the darkness ahead. What are some of the lines you’ve stepped over–and why did you cross them? 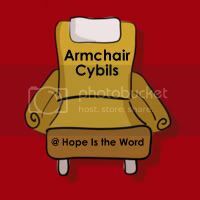 Don’t forget to take a look at Barbara H’s meme “The Week in Words”, where bloggers collect quotes they’ve read throughout the week–and Amy’s Armchair Cybils where we’re reading Cybils nominees. Have you ever been afraid to pray? “I turn the pages a my prayer book to see who I got tonight. A few time this week, I thought about maybe putting Miss Skeeter on my list. I’m not real sure why…. I’ve been scared to pray. Scared to pray because I know that God will expose my evil intentions. Scared to pray because I know God will judge my unrepentant heart. Scared to pray because I know that God will call me to act. Prayer is a scary prospect. It’s coming face to face with the Holy King of the universe. It changes us. It changes circumstances. It changes things the way God wants them instead of the way we want them. But if prayer is like electricity, an unpraying Christian is like an unplugged lamp–decorative but useless. Lord, I’m scared, but I’m gonna choose to pray anyway. I thought that the quotes I had flagged in my copies of Anne of Green Gables and Anne of Avonlea were to no purpose. But now that I’ve got them written on the same page, I see they have a theme after all: Contentment. I think I agree. I do so love having a variety of experiences–but for everyday life, I’d really much rather be Rebekah of the House of Dreams, watching the sun sink over the lake and then slipping into sleep myself in my own bed. I can sympathize with Jane’s feeling that diamonds must be comforting. I’ve felt that way about wealth myself. I’ve imagined myself not having to work for a living, able to devote myself to the various and sundry interests and cause I care about. But I must come to Anne’s conclusion: I’m quite content to be Rebekah Menter, RD, working-girl. This is a good life that God has made for me, and I am content to be here. I love Mrs. Allan’s dreams for Anne, and how these dreams remind me of the many women I love so much who have encouraged me so much. “I would like to see you go to college,” Mrs. Allan says, but I should best like that you would be content wherever you are. And by the grace of God, I am and shall be. Don’t forget to take a look at Barbara H’s meme “The Week in Words”, where bloggers collect quotes they’ve read throughout the week–and Carrie’s L.M. Montgomery Reading Challenge to see what everyone else is working on.